"I'm just back in NYC and feel very buoyed by the intense immersion of the last fortnight. The space you have created at the camp through your commitment to the well being and future not only of elephants but of elephant people is downright remarkable. It's not often one meets people who live their lives in such an integrated way. Thank you too for the amazing hospitality—morning chai in the mists, evening beers under the stars, mid-day dosais in the sunshine—and a healthy dose of reality with a swarm of bees! Warm regards and trumpets to all." Film-maker and elephant researcher Prajna Chowta has been appointed Chevalier de l'Ordre National du Mérite (Knight in the National Order of Merit), one of the highest civilian recognitions of the French government. The Hindu - article: "France confers knighthood on elephant researcher"
The conference programme addressed all aspects of elephant culture, past, present and future and in all continents. It dealt with both material and cultural concerns, and covered both the Asian and the African elephant. Prajna Chowta participated in the event with a talk titled : Cultural aberrations in the management of captive elephants. Régis Debruyne was invited to expose the Contribution of comparative genetics to the understanding of the evolution and distribution of elephants. From left to right: Dharma (8 years), Kamali (3 months), Gaja (2 years), Kalpana (40 years), Kuja (3 years), Kunti (32 years). They are more autonomous but still come back to camp on their own regularly to receive their supplement ration. Kunti gave birth to her 3rd calf: a female born on November 2nd, 2015. She was 91 cm in height and was named Kamali. Introduced by Aane Mane Foundation in exclusive collaboration with Geotraceur (France), ElephanTTrackinG is a complete wildlife tracking system that includes the latest technology available today. ENFANT D'ELEPHANTS is the true story of Ojas, a little girl who lives in a forest in South India amongst elephants. She owes this childhood to her mother, Prajna, who left behind everything in search of the roots of her culture and lives with elephants, much like a hermit known in Indian mythology, Palakapya. After 11 years at the camp, Kalpana has finally given birth to a male calf on the 22nd of October, at dawn. She is deeply involved in the care of her first calf, 93 cm at the shoulder and in perfect health. The calf was named Gaja (pronounced Gadja), which means 'elephant' in Sanskrit. Kuja, a female, 90 cm at the shoulder, in perfect health. Aane Mane is proud to participate in the testing of the first prototypes of elephant tracking collars designed and made in India. The project was undertaken by two young electronic engineers, Radhika Gandhi and Bharath Patil, under the direction of Dr. André Pittet, Chief Advisor at the Center for Electronics Design and Technology (CEDT), Indian Institute of Science, Bangalore. GPS collars may prove useful in the mitigation of human elephant conflict in areas where the elephant habitat is fragmented and occupied by human settlements. As many as 16,000 Asian elephants–one third of the entire population–are captive. 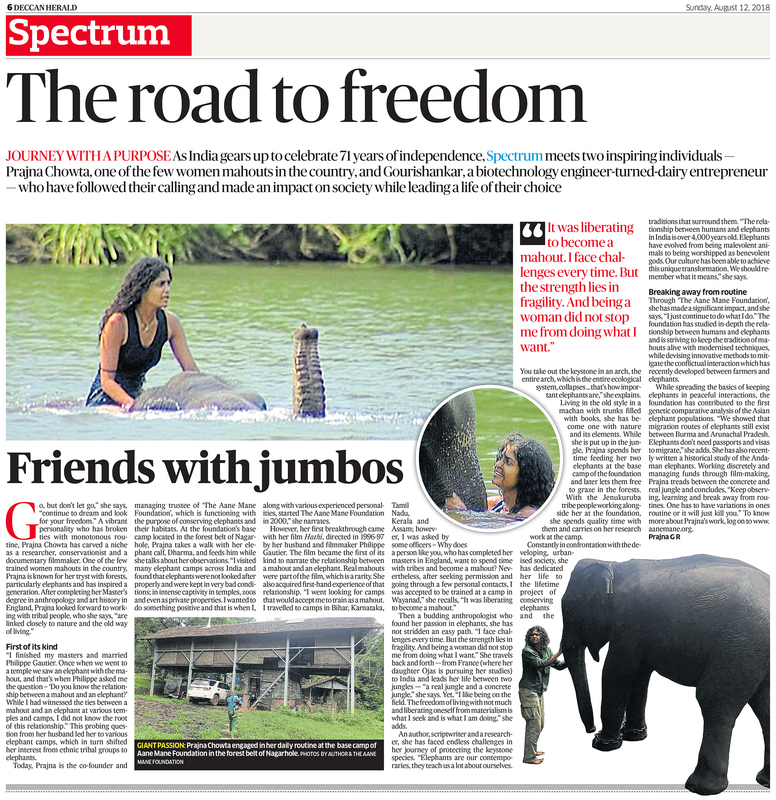 In India alone, about 3500 elephants live in various and often critical conditions of captivity, contradicting the contemporary notions of wildlife conservation and animal welfare. ELEPHANT CODE BOOK by Prajna CHOWTA, 138 p. 2010. ISBN 978-81-909731-0-6. Asian Nature Conservation Foundation www.asiannature.org & Aane Mane Foundation, Bangalore, India. In two years, Dharma has reached 1.40m and around 500kg. Dharma was born on 7/7/2007. An auspicious date!